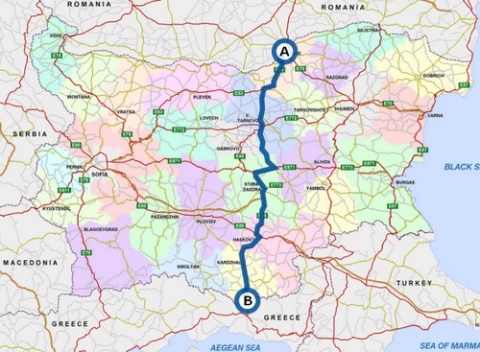 Bulgaria's government will launch September 1, 2011, the long-anticipated construction of a key section of the road from the Danube city of Ruse on the Romanian border to the Makaza Pass on the Greece border. The section in question is the road between the southern Bulgarian city of Kardzhali in the Eastern Rhodope Mountain, and the village of Podkova, which is located just 15 km north of the Makaza Pass on the Bulgarian-Greek border, at an altitude of 331 m, in the Kirkovo Municipality. Podkova is also the southernmost train station on Bulgarian territory, and the end of the Ruse-Podkova railway which was never extended to reach Greece's Aegean coast in spite of projects for that dating back more than 100 years because of political reasons. 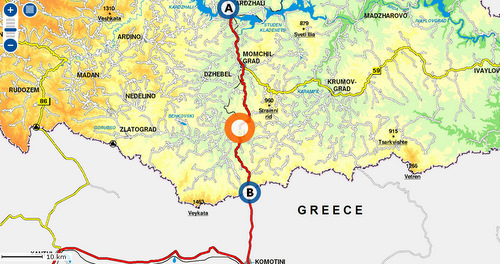 The 24-km road section between Kardzhali and Podkova, whose construction is to be launched September 1, will be connected to the already completed road between Podkova and the Makaza Pass, thus providing a fast and direct road connection from Central Southern Bulgaria to Greece via Kardzhali. The Ruse-Makaza road linking Romania and Greece through Central Bulgaria is supposed to be part of the Pan-European Transport Corridor No. 9 leading from Helsinki, the Baltic states, Moscow, Kiev, and Bucharest to the Greek port of Alexandroupolis on the Aegean. 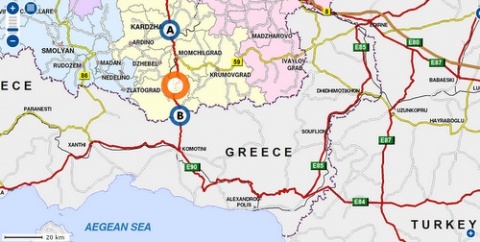 However, the international transport corridor, which harbors the potential to stimulate the development of much of Bulgaria's central regions does not function at present because the Makaza Pass in the Rhodope Mountains on the Bulgarian-Greek border remains closed. This is in spite of numerous promises in the past five years by senior Bulgarian and Greek politicians that a border crossing point there will be opened "next year." The start of the construction of the Kardzhali-Podkova road was announced Tuesday by the Bulgarian Road Infrastructure Agency, which said it had just signed the contracts with a consortium of construction companies. The news comes after last week the Bulgarian government declared the he road from the Danube city of Ruse on the Romanian border to the Makaza Pass on the Greece border to be a project "of national importance" in a long-awaited move. In addition to the construction of the new road, the project also provides for the rehabilitation of 7.5 km of an existing road from Kardzhali to the Dzhebel station. The project will be carried out by a consortium of "Integrated Road Systems", Patstroyinzhenering, Patstroy, and Road Construction Company SBS called "Kardzhali-Podkova" for a total of BGN 32 M. The funding comes from EU Operational Program Transport. The delay in the opening of the Makaza Pass, which is some 20 km north of Greece's Aegean coastline, has been attributed to the slow construction of the road on the Greek side of the border. If it becomes fully operational, the Ruse-Makaza Pass road will provide the shortest route from Romania's capital Bucharest (and much of Central and Eastern Europe, for that matter) to the Aegean / Mediterranean. On Bulgaria's territory the Ruse-Makaza Pass road (section of Pan-European Transport Corridor No. 9) goes through Ruse, Byala, Veliko Tarnovo, Dryanovo, Gabrovo, the Shipka Pass (Balkan Mountain), Kazanlak, Stara Zagora, Dimitrovgrad, Haskovo, Kardzhali, and Momchilgrad to reach Makaza. It is dubbed Road I-5 (E-85) for Bulgarian government purposes. The long-anticipated decision of the Bulgarian government to make the Ruse-Makaza road a "priority project" is justified with the need to absorb EU funds under Operational Program "Transport", which would allow faster administrative procedures for investments, land expropriation, and construction. The Bulgarian government plans to turn the road in question into a "high-speed way" (with four lanes). The actual realization on European Transport Corridor No. 9, however, also depends on the realization of one of the most-talked about infrastructure projects in Bulgaria in the past 20 years – the construction of a tunnel under the Shipka Pass in the Stara Planina Mountain (Balkan Mountain), which is supposed to improve greatly the transport links between Northern and Southern Bulgaria along the Ruse-Makaza route. In addition to the construction of the Kardzhali-Podkova road, the Road Infrastructure Agency announced the start of a project for the rehabilitation of 25-km road between the towns of Batak and Dospat in the Western Rhodope Mountains, which was last repaired 10 years ago. The project will be carried out by a consortium called Batak 2011, which includes Integrated Road Systems and Patisha AD, for 4 months for a total of BGN 12.4 M; the funding is from EU Operational Program "Regional Development" and from the state budget.